Today, I had two special holiday highlights! The first event was meeting my friend Susie for our annual Christmas Boston lunch together. We met 18 years ago when we were both in graduate school at University of Massachusetts at Boston and then in the evening we went to my 8th grade daughter’s holiday band concert. You can never hear the Grinch too many times! I realized this is what truly brings me joy this time of year! Unfortunately, there is so much stress! Scientific research confirms what you may already know, many happy occasions are when we you’re most likely to feel anxious, overwhelmed, and sad. Most festive periods involve change and even positive change causes too much stress. The real challenge we all face this time of year is losing our sense of balance. Our sleeping, eating well and exercising all get interrupted by the incredible demands and are usually the first to drop off the priority list. Sometimes we also have our expectations way too high forgetting that the Hallmark movies are truly just a movie and life is rarely that perfect. Just a reminder as one of my friends from Australia would often say, “Go gently.” This is the time of the year where we need to sit back and relax a little more and remind ourselves to find time to recharge even though scheduling gets super busy. 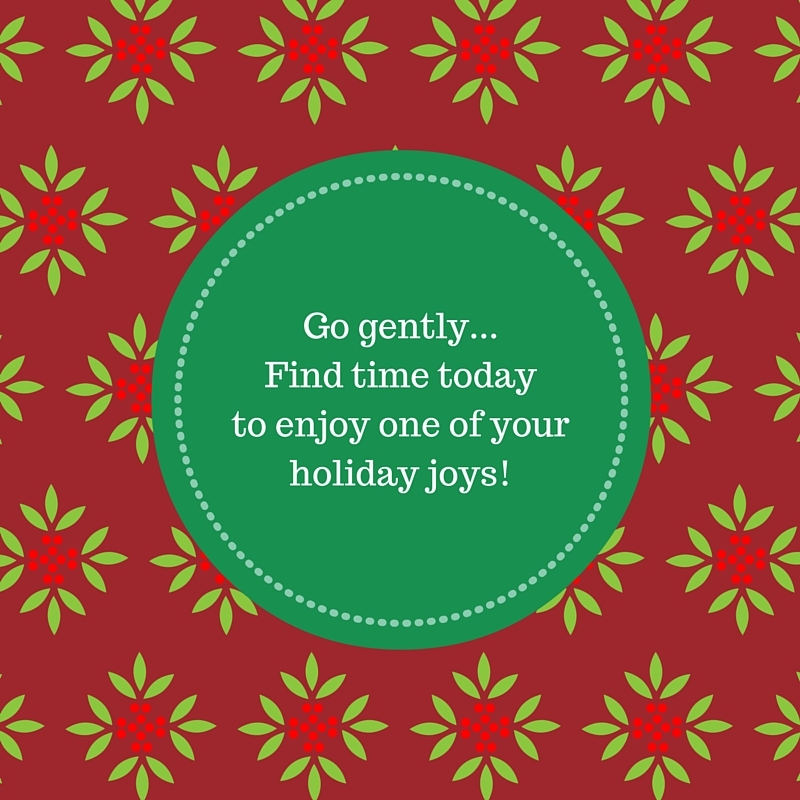 Find time today to enjoy one of your holiday joys! I am going to bake cookies today for the annual Cookie Bake. The Cookie Bake is also one of my favorite Christmas traditions! It began when I was in high school and I invited my close friends over for a night of cookie baking. The tradition continued when I went to Graduate school in Boston and we are now on our 28th annual New England Cookie Bake! Enjoy every little joy you can this holiday season!